The first guidelines for the project of the Admiral Hipper class cruisers were formulated in February 1934. According to them the ships had to meet three basic requirements. They had to be bigger than the French Algerie, faster than the Dunkuerque and have the range that would enable them to operate in the Atlantic. As planned, the cruisers were to be armed with 15 to 20.3 cm guns, but Admiral Raeder opted for the heavier calibre artillery. However, their installation would increase the dimensions of the ship as designed. 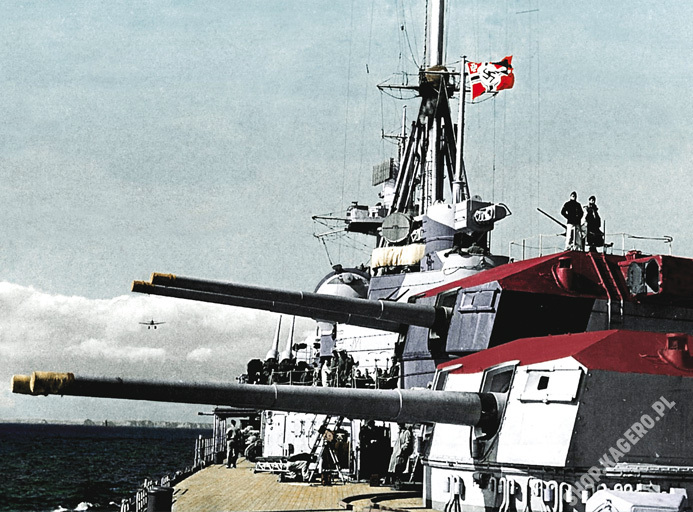 At that moment, when the decision concerning the propulsion unit and armour, estimated at 1 980 tons and 2 140 tons respectively was not taken, the installation of 20.3 cm guns would increase the current displacement of over 10 000 tons. The construction of such ships was out of the question as the limitations of the Treaty of Versailles permitted Germans to build cruisers only up to 6 000 tons. It can be seen, that it was not a good time to officially build the ships, however, the construction work was being continued and the specifications were highly classified. An order for the first two units G - Ersatz Berlin and H - Ersatz Hamburg was placed on 30 October 1934. They were to be built by the following shipyards (see table 1 and 2). Admiral Hipper was the first to enter service, thus becoming a prototype ship. Soon after being commissioned, she was subjected to intensive and detailed technical trials, which revealed certain shortcomings and defects of the cruiser. Those were: poor seaworthiness caused by a faulty stem shape, excessive smoking of the quarterdecks and insufficiently equipped conning tower. Final sea trials of the cruiser lasted through the entire March and the most of the following month, concluding in the end of April 1939. The commissioning of the Blücher, launched five months after the Hipper, was delayed almost five months. It was caused by construction changes which were incorporated right after the Hipper completed her sea trials. In this way, the Blücher which in July 1939 was ready for action, was first sent to the shipyard for modernization. The hawse pipes were replaced by anchor cluses on the edge of the forecastle and the straight stem was converted to a raked and curved “Atlantic” style clipper bow. Also the funnel received a raked cap and on 6 September the shipbuilder’s trials started. They were successfully completed on 18 September. Two days later the ensign was hoisted during an official ceremony and the heavy cruiser was commissioned into the Kriegsmarine. Captain Hellmuth Heye became the first commander of the Admiral Hipper. On 6 June 1939 the ship moored in Kiel, where she took part in the celebration of the “Kieler Woche” (Kiel Week). The subsequent, second training voyage lasted from 3 to 24 July. The route led to Estonia, where she called at Reval (Tallinn) and to Sweden. There, she called at Härnösand, located in the Gulf of Bothnia. During the voyage, the first artillery tests were carried out. On her return, an intensive evaluation and tests for the so called EKK1 began on 14 August. They were conducted on waters of the western and eastern Baltic Sea. The trials were temporarily stopped at the outbreak of the war, and Admiral Hipper was detached to the western waters of the Baltic Sea in order to prevent the warships of the Polish navy from breaking through to the Great Britain or France. In the middle of September, when the war in Poland was drawing to an end, the cruiser was detached to the eastern waters of the Baltic Sea in order to continue the EKK exercises and trials. On 31 October 1939 a group of Soviet navy officers visited the deck of the Hipper, taking part in the artillery exercises carried out in cooperation with the target ship Hessen. Their presence was connected with the talks concerning the Soviet purchase of one of the Admiral Hipper class ships. Three of the ships were considered for sale: Lützow, Seydlitz or Prinz Eugen. A week later, the cruiser entered the basin of the Blohm Voss shipyard in Hamburg to remove the defects observed during the exercises and trials. She remained there from 6 November to 8 January 1940. At that time, the stem was rebuilt into the “Atlantic” style clipper bow. Also the funnel received a streamlined cap and the admiral’s bridge was installed. Moreover, some smaller alterations of the superstructure were made. Those included changing the position of the kitchen waste pipes, outlet ventilation pipelines and the like. 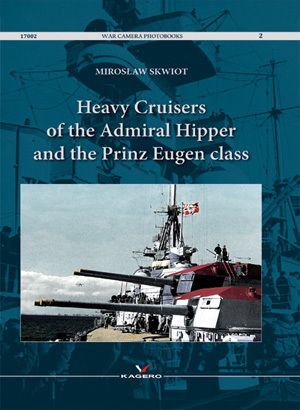 When the shipyard work in Hamburg was finished, the cruiser steamed to Kiel. There, the final mooring trials were carried out as a part of the EKK research and tests. In the second half of January 1940 all the shipyard work and sea trials were finally completed and Admiral Hipper was detached to Wilhelmshaven. On the arrival, she came under direct command of Admiral Wilhelm Marschall and was assigned to a task force along with the battleships Scharnhorst and Gneisenau.